Oh So Deadly is a deceptive name since the cocktail is actually from the mild section of The Mai-Kai’s extensive menu. It packs intense flavors, however, ranking it among the best of the mild drinks. Until recently, we were convinced that cinnamon was a featured ingredient. 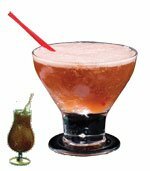 When this guide was launched in 2011, Oh So Deadly was among 10 cocktails that we thought contained cinnamon syrup, a key secret weapon of Tiki bar pioneer Don the Beachcomber. 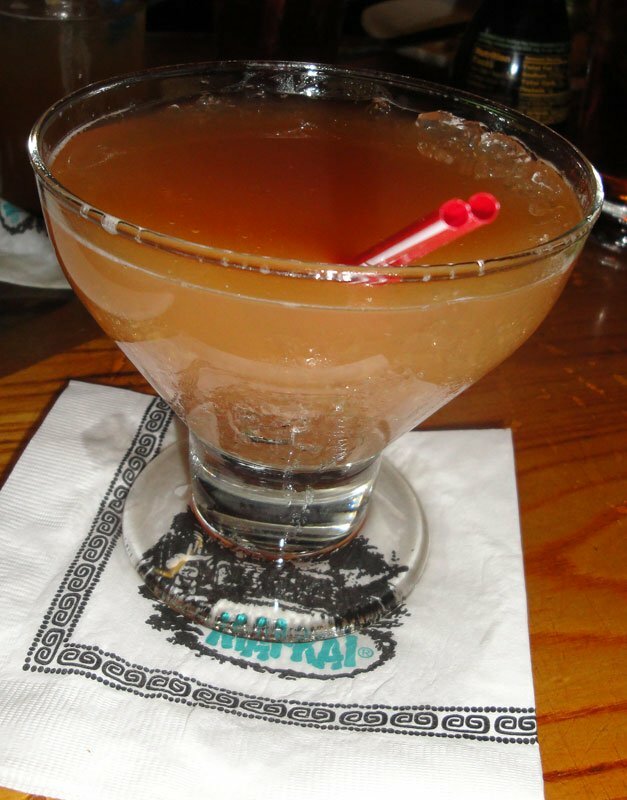 Many of The Mai-Kai’s best drinks are direct descendants of Beachcomber classics from the 1930s through 1950s, when original mixologist Mariano Licudine tended bar at Don the Beachcomber restaurants in Hollywood, Calif., and Chicago. In this case, Oh So Deadly can be traced back to Never Say Die. In 2012, we posted our take on Oh So Deadly featuring cinnamon and considered this among our better tributes. However, in June 2015 we learned that cinnamon syrup is not featured in any of the current cocktails. Manager Kern Mattei and owner Dave Levy assured me that it’s not used anywhere on the menu, though the cinnamon sticks used for garnish in several of the drinks can give you that illusion. 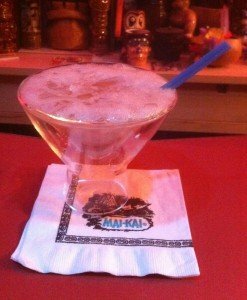 This caused a minor stir on Tiki Central, where Mai-Kai cocktail fans debated the revelation. 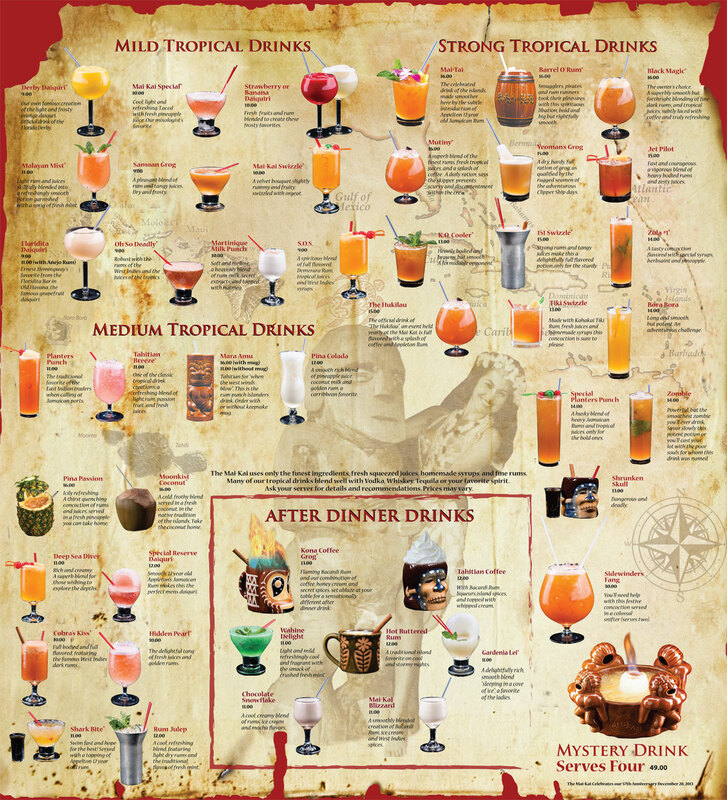 The distinctive juices, rums and syrups used at The Mai-Kai have always given the cocktails a unique flavor that’s nearly impossible to duplicate. The phantom cinnamon flavor in drinks such as Oh So Deadly just reinforces that fact. The juices come fresh-squeezed from South Florida groves, the rums include bold Jamaican and Demerara brands, and the syrups are house-made following mysterious recipes that only Levy knows. More recently, the recipe was tweaked to add falernum, which gives it an added boost of flavor. This Caribbean syrup features many exotic flavors, including almond, ginger, cloves, and lime. It’s featured in multiple drinks on the menu, including Cobra’s Kiss, Mai-Kai Swizzle and S.O.S. Oh So Deadly contains a healthy dose of falernum, making it perhaps the best showcase of all. What also sets it apart from many of the other mild drinks is the inclusion of two of The Mai-Kai’s most distinctive rums (Demerara and dark Jamaican). The mild cocktails typically contain light and gold rums that don’t impart as much flavor. Oh So Deadly is an exception to that rule. Robust with the rums of the West Indies and the juices of the tropics. Flavor profile: Falernum, honey, dark rum, lime, bitters. Review: Cool and refreshing. Sweet and sour elements blend nicely with subtle hints of exotic dark rums. 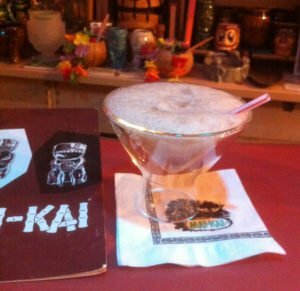 Ancestry: Dating back to The Mai-Kai’s original 1956 menu, Oh So Deadly is a direct descendant of Never Say Die from Don the Beachcomber. Bilge: The artwork for Oh So Deadly that appeared on The Mai-Kai’s menus prior to the 2014 revamp (inset above) was remarkably similar to the artwork used by Don the Beachcomber (see above). This is no coincidence: They shared the same menu artist in the 1950s. 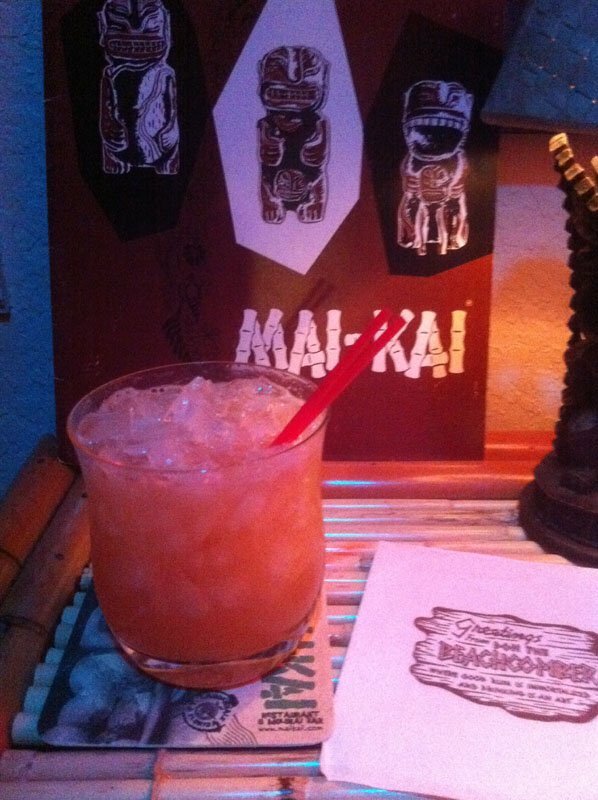 Decades later, even after the drink had changed glassware, The Mai-Kai was still using the original artwork. Realistic drink photos were added in 2014 (see story). Blend at high speed with 4 ounces (1/2 cup) of crushed ice for 5 seconds. Pour into a wine goblet or specialty glass. Add more crushed ice to fill. As served at Don the Beachcomber, Hollywood, in the 1960s. * The rums can make or break any cocktail. As usual, we recommend one of the many quality Spanish-style white rums such as Don Q, Cruzan or Flor de Caña. There are several good dark Jamaican options, but we opted for Coruba Original for this recipe since it adds the required sweetness. Recommended Barbados rums include R.L. Seale’s, Doorly’s, The Real McCoy, Plantation, Mount Gay, and Cockspur. All are high quality at a reasonable price. It’s interesting to note that while this 1960s recipe includes Barbados rum, the Don the Beachcomber menu description featured at the top of this article refers to Demerara rum, which is what The Mai-Kai uses. Except for the falernum, Oh So Deadly is a very close replica of Never Say Die. Originally, we thought it contained cinnamon syrup and crafted v.1 of the tribute recipe (see below). But in June 2015 we learned that was not the case, and in April 2016 manager Kern Mattei also confirmed that falernum was now being featured. Indeed, it’s now the dominant flavor in Oh So Deadly, giving the drink much fresher flavor than the old phantom cinnamon taste. * The lime and orange juices used at The Mai-Kai are fresh and unpasteurized, arriving daily from a South Florida grove. Lacking fresh Florida OJ of this type, your best bet is to squeeze the fruit fresh. Just be aware that California oranges aren’t as sweet as those from the Sunshine State. The key lime juice blend is tart and flavorful, another unique feature. I’ve been able to duplicate it by combining bottled key lime juice with fresh-squeezed Persian lime juice. This Tiki Central thread contains more details on the juices. The Mai-Kai uses Dole 100% pineapple juice, which is an industry standard. If you prefer, fresh-pressed juice will impart even more flavor. * We’ve always recommended Fee Brothers falernum since Beachbum Berry touted it as the formula that comes closest to the syrup likely used in Don the Beachcomber’s day. A recent confirmation that The Mai-Kai now uses this brand cements our recommendation. It’s a little on the sweet side, but it’s full of flavor and works well in The Mai-Kai’s savory cocktails. 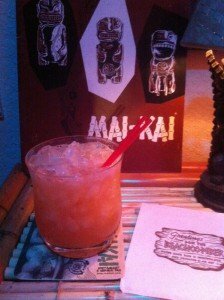 * The honey mix employed in most Mai-Kai cocktails is very rich, so we recommend a 2:1 ratio of honey to water. Just combine and store in a jar in the fridge. 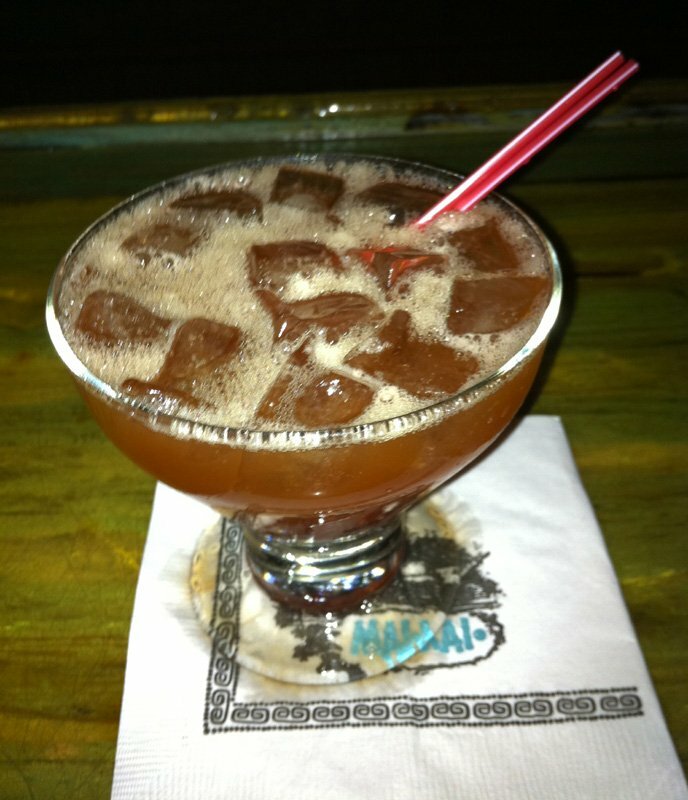 * This is one of the few mild Mai-Kai cocktails with such an interesting mix of rums. With white rum as the base, the addition of Demerara and dark Jamaican rums creates a unique flavor profile that goes all the way back to Don the Beachcomber classics such as the Zombie and Navy Grog. We confirmed that this drink has both back in 2012, spurring the original tribute recipe. In the meantime, the rum brands used at The Mai-Kai have changed, but the flavor profile is similar. When the rare Kohala Bay from Jamaica became unavailable in mid-2016, Appleton Estate Reserve Blend became the new standard. It has less punchy flavor, but this drink doesn’t suffer much. [More on The Mai-Kai’s Jamaican rums] In April 2012, The Mai-Kai brought Lemon Hart Demerara rum back to its cocktails, a much-welcomed addition. After about 2 1/2 years, Lemon Hart went on hiatus and El Dorado Superior Dark temporarily took its place in many drinks that used the 80-proof version. But Hamilton rums from Guyana stepped up in early 2015 as the de facto Lemon Hart replacement, and the 86-proof version became a worthy addition. Lemon Hart’s 151 rum returned to the U.S. market (and The Mai-Kai) in 2016, but Hamilton 86 remains the standard lower proof option. Click here for the full story on Lemon Hart and Hamilton at The Mai-Kai. The Mai-Kai likely uses their call-brand white rum in most of the mild cocktails, a Virgin Islands rum (Ron Carlos) that’s a product of the Cruzan distillery. You could use Cruzan’s standard white rum, Barcardi, Don Q, or any other Spanish-style silver rum. Just avoid funkier, flavorful white rums since this is meant to be the base mixer that lets the other rums strut their stuff. The potency may be more subtle than its stronger brethren, but the flavors in this drink still pack a wallop. This entry was posted in Cocktail reviews, Cocktails, Cocktails, Mai-Kai, Recipes, Rum and tagged Barbados rum, Beachbum Berry, Cinnamon syrup, Dave Levy, Demerara rum, Don The Beachcomber, falernum, Hamilton 86, Kern Mattei, Kohala Bay, Lemon Hart, Mariano Licudine, Oh So Deadly, Tiki Central. Bookmark the permalink. Made it tonight, very good! Thanks again for posting all these recipes, they are fun AND delicious! It seems like every Mai Kai’s recipe really took a turn for the worst with the removal of cinnamon syrup and addition of appleton xv. In regards to the syrups, I don’t claim to know all the nuances. While cinnamon may not be in play, we know that in some cocktails they are still using other secret syrups that date back to Don the Beachcomber. More on this to come. Batching this tonight x 6, as I like to save time and find a drink that I like and batch it. It usually lasts a couple days in the fridge, especially when you aerate it in the spindle mixer. I took a small sample, tastes just like the Mai Kai. I upped the Falernum a tad as I remember really tasting that forward, and I 50/50 mix fee brothers and John D Taylor. I think that mix gives a nicer, more robust product. I love your recipes! Thank you for all of your research and hard work. I actually just celebrated my birthday this past Friday at the Molokai lounge and then spent the night with dinner and the show. I grew up in South Florida, but my wife and I moved up here to Ocala about 15 years ago. 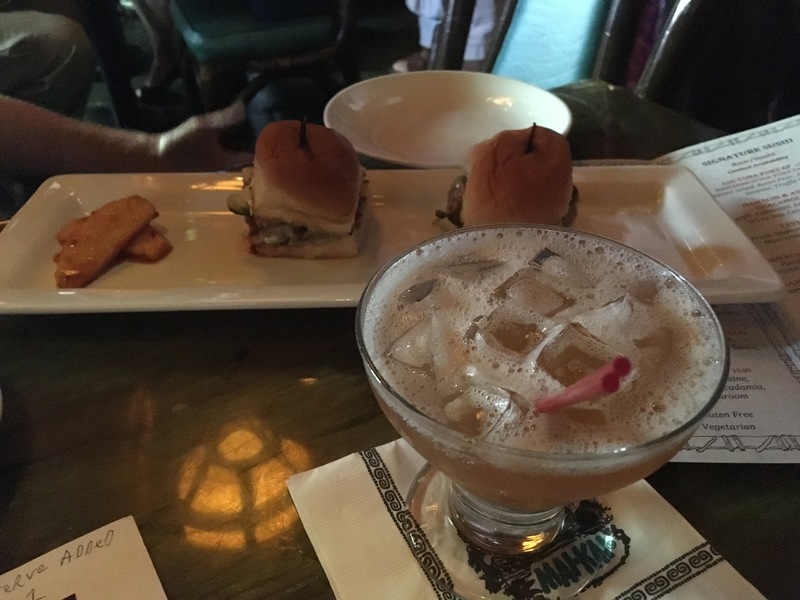 I really try to get down there as much as I can just for the Mai Kai, and I also like driving up to Atlanta to visit Trader Vic’s. Aloha Aaron! Glad we could be of assistance. As fate would have it, I just had an Oh So Deadly tonight at The Mai-Kai. Happy birthday!